My Home and Garden: Tomatoes are beginning to flower. 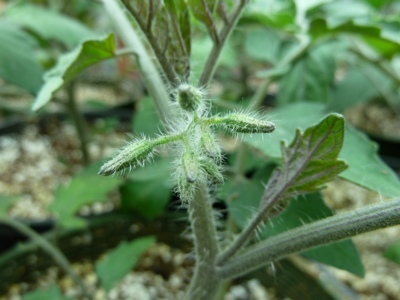 I cannot believe that my tomatoes have begun to set little flower buds. They are still tiny and under the grow lights. I have also decided to break with tradition. I am going to leave the side branches on the Sungold's this year. I pruned them all off last year and got very few tomatoes. So this year, I'll leave them. When I was young, my grandmother told me when pruning tomatoes to prune in the joints. In your first pic, you would pinch out that little bit in the joint. She said the reason to do that is so the tomatoes on the large branch don't have to share the nutrients. I used to prune like that in Saskatchewan and had great tomatoes. 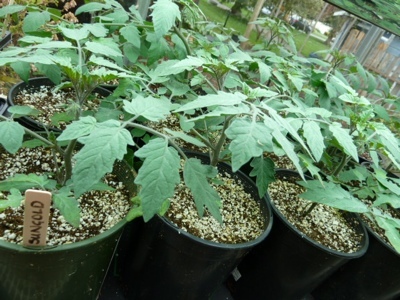 I may have had great tomatoes anyways, who knows, as I never did a test pruning some and leaving others. Now I have too much to do and don't prune them. But with our longer seasons here, the tomatoes do great. Yours look nice and healthy.